Only about 15% of all artists make a living from their work. I wrote the first edition of Artist’s Life for the other 85%, as well as those succeeding. Now I’ve updated it, covering critical subjects that I didn’t before and expanding on others. So whether you’re an unrecognized master still struggling to make your career click, a recognized master intent on maintaining your success, or are just starting out, I wrote the book for you. I’ve been in the art business since 1991, and have placed roughly $12 million in work by artists of various regions since then. Consequently, I’ve learned a great deal about advancing careers. Why write the book? 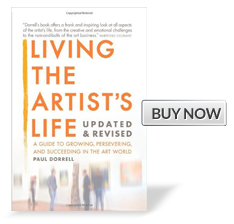 Because most artists are never fully taught how to effectively navigate the art world, whether they live in LA, the Midwest, New York, Paris, or the Northwest. Well it isn’t a mystery. There are proven approaches that work. I’ve covered them in detail. My point of view, as a successful but untypical gallery owner, may prove informative, though of course you should consult other points of view as well. Am I only concerned with your prosperity? No, since that’s only one part of an artist’s life. In fact many artists I know are indifferent to making money. But most, in the end, would like to earn income from their work. I can assist with this, and many related issues. The memoir section has also been expanded, with me telling more about our crazy journey: my dances with near-bankruptcy, my dances with booze, the years of despair, the years of success, and the challenges of sanely raising a family through all this. I believe you’ll find our failures and victories illuminating. I’m pretty candid, since to me anything less would be a disservice to us both.